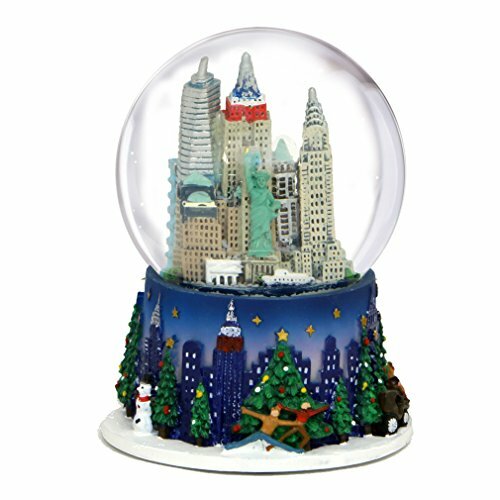 New York City skyline Rockefeller Center Christmas snow globe featuring Rockefeller skaters, Empire State Building in Christmas colors, Statue of Liberty, Chrysler Building, CitiCorp, Central Park horse drawn carriage, Christmas trees and a snowman. 3.5 inches tall with a 65mm glass globe. Makes a great NYC Christmas gift. If you have any questions about this product by City-Souvenirs, contact us by completing and submitting the form below. If you are looking for a specif part number, please include it with your message.